5) Finish the bodice pieces with a serger!!! Before I started working with Susan, I was doing alterations for a local ID school. The bodice was completely bag lined, including the zipper seam (no seams are visible in the lining of the bodice). The hem of the bodice and top of the skirt were finished with bias tape. It LOOKED great, fantastic, but inside the bag lining all the fabric (including the lining) was fraying a great deal. This obviously impacted the amount the bodice could be let out because of the decreased fabric stability. When I altered them I always put things back as I found them, however, it was very time consuming. This all changed when I met Susan. After I spent very little time serging the lining to the embroidered bodice pieces, I was hooked. Found myself a good serger the next day. Alterations are obviously easier because you can tell at a glance if there is room to let out (instead of feeling for seam allowance through the bag lining), and there is only one layer to work with instead of two (and the subsequent number of seams). And obviously if all the seams are finished off with a good serger, there are no fraying issues. While I understand there may be a short debate about which looks better, there are two things I take issue with when it comes to bag linings: 1) since re-sale of these dresses is so important, alterations should be A) easy to do, i.e. 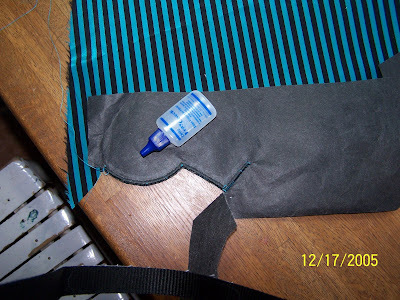 seams are easy to get to, and B) the fabric should be properly finished to ensure that fraying does not decrease seam allowance; and 2) if a bag lining is used, the zipper seam should be covered by it or serged. Here is a pic demonstrating what I have seen too many times – unfinished fabric edges at the zipper leaving threads to be caught (the uneven seam here is another issue). UPDATE: OK, my editor feels I am being a wimp. “‘Unfinished seams’ are not the [only] problem with [this] neckline. The zipper and neckline are not finished properly. I can live with large, unfinished seams (especially with fused, knit fabric as in the photo). But I won’t accept the top of that zipper and neckline binding. This is extremely unprofessional and ugly.” I agree…but she says I am still being too nice…give me time! So that brings us to the next topic…. 6)There is a good way to insert zippers and neck facings. 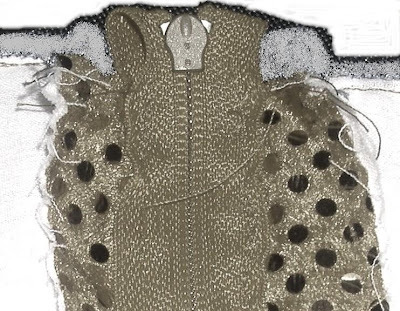 And here’s a link that explains it all beautifully: zipper. It was a bit inside-out for me at first but now my hands just make it happen. I used to hate, detest, DESPISE zippers…no big deal now. The facing also makes all the difference in the look, even when the collar is shaped and satin-stitched. I will admit I have cut corners a time or two and not done it when my fabric is already very stiffened as on two 2-piece solos I just finished. Otherwise, I always do this. 7) Line up the pleats with the seams. This pic is of the waist seam between the center front bodice and the center front pleat (CFP). There is an OBVIOUS problem in that they do not even remotely match in size…and the CFP is not centered. (There has been a very long pause here as I struggle to comprehend this mistake which was not made by a newbie.) Note to self – make sure pattern pieces are matched. Every time. Why is this important? Because it looks awful and amateurish! I am assuming that the basic shape of the ID dress came from a princess line dress – it is the basis for all our patterns whether our bodice is a princess line or 0ne-piece darted. When there is one base color, lining up the pleats with the bodice seams is not as crucial…who can tell as long as the designs are centered? Looking back, there came a time when the center fronts of the dresses were done in a different color. The emphasis was still on this princess line shape so the center front bodice and CFP had to match up in width at the waist to continue the unbroken line from the neck to the hem. Makes sense to me. So, unfortunately, this take on the center front of the dress is not ready for prime-time! 8) Press, baste; press, baste; press,PRESS, baste, BASTE!!! My mother told me this, my sewing teachers (when I was 10, 17, 20) told me this…Susan added that pressing as I went along was perhaps most important. But, I am a master with pins. I really am!!!! But not when it comes to the physics of Irish Dance dresses. Unpressed, stiffened fabric pulls no matter what is done to it. Add the Timtex and no pin can answer the call. So I press using steam with a pressing cloth and then pull out the long needles and the upholstery thread and get busy. Saves so much time and frustration in the long run. I use upholstery thread because it is thicker (and waxed in some cases) and so it pulls out easily whereas the thinner stuff breaks in the thick layers. So true. And again, with these stiffened, precisely made dresses, using precise markings is really the key. I should have put this first because all of the pressing and basting can only be as clean and sharp as it must be when I have clear lines to follow. I will admit I did feel as if the work I did getting the first dress I did with Susan ready (my “training” dress) was tedious and never-ending, but when I was able to move so quickly once the sewing began, I understood completely and was a convert (really and truly, this is not a religious cult despite my many attestations to conversion!). I mark everything very carefully now, every time. 9) Do not let the skirt lining bag. Major pet peeve of mine. I am a mom that wouldn’t let her daughter out of the house (beginning at age 1 going to the park with Dad…truly have mellowed 16 years later) if the hem of her little denim jumper was turned up from the dryer. Don’t get me started on the mental illnesses associated with that… however, on something that is supposed to be as clean and crisp looking as possible, seeing the lining bagging below the hemline on an ID dress makes me nuts. Such an easy thing to avoid! Sewn hem: 1) after the lining and outer skirt are hemmed together, trim and clip the seam on the curves, then press the seam on the right side so the seam lies underneath the lining. 2) Then use a multiple zig-zag stitch to attach the lining to the underneath seam fabric. The multiple zig-zag allows give on the curved seam and helps keep the lining fabric from falling below the seam to be seen from the outside. 3) Iron the fold between the lining and outside skirt. I press on the inside so I can see a thin line of outside fabric to ensure the lining cannot be seen at the bottom of the hem on the outside. 4) Then, I take the time to smooth and pin the lining to the outside fabric so I can sew a few lines of stay-stitching on fold lines from the hem to the waist. This basically guarantees that there will never be any bagging. Satin-stitched hem: Before I insert the stiffening, I complete step 4) from above. Then, I stitch the stiffener into the hem. 10) Take the time to learn how to satin stitch and then TAKE the time to satin stitch correctly. Nothing worse than crappy satin stitching. I saw the example below a couple of months after I started making ID dresses and had to scrape myself off the floor. Completely beyond my comprehension..the money paid for this dress…the shoddy workmanship…I was speechless and Susan laughed that humorless, sardonic laugh she uses on me when my naivete is glowing radioactively. Stunning. I should think the problems with the satin stitching in the pic above are obvious…however, I feel the need to elaborate. First, the density of the stitching is not even. The obvious assumption here is that this is hand done (as are most/all edges) which means that the stitcher is forcing the fabric through the machine. Yes, sometimes our thicker fabric is difficult to get under the foot… this is where a practice piece comes in handy. How will it move? Does it need help? Is a plate needed to accommodate the extra thickness so things move smoothly? Second: the width of the stitches is not even…let the machine do it’s job!!!!! Stop fussing and moving things around. Guide the fabric STRAIGHT and back off. Do not push and shift. One thing I do on edges to help with the two issues above is use tear-away to help the machine move it through smoothly as some fabrics are “sticky” like lycra or get snagged. Here is an example as seen from the lining side of a skirt. (This hem was done in different colored sections which is why only one part is done.) After I cut the shaped hem, I attach a length of tear-away using a small zig-zag. Then I do the first round of satin-stitching (rayon here, metallic would be second round). Then I Fray-chek and tear just the area hanging below the hem which allows the second round of stitching to cover any tear-away fuzz on the bottom, but leaves the rest to protect the lining and help move it through smoothly. After the second round of stitching, I Fray-chek again and tear the rest off. Third: learn how to get around a corner. So many different ways. I have a couple, but we all have to deal with our own temperamental machines and fingers. Before each new hem/pleat/crown, it is worth my time to refresh/refine my memory or maybe try something new. Remember to remember! Fourth: Fray-chek and then TRIM! When done, put fray-chek on the back and points of the embroidery. Let dry…trim threads and any fuzzies. Depending on the color, I try not to put Fray-chek on the front, but sometimes it is necessary. Do a fabric test. It shows on some…others can be scratched to make it invisible. 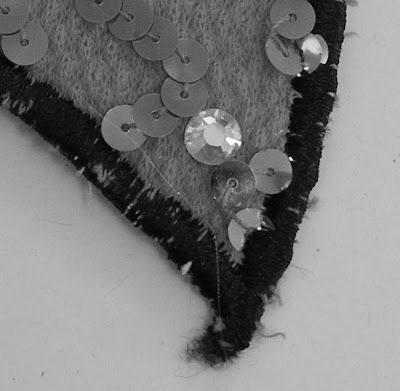 11) Sequins: The above pic brings up another special consideration when making ID dresses… satin-stitching around sequins. I have read a lot about dealing with them, watched Susan, asked questions… they are awful. But, there are ways of making them behave. The pic below shows the equivalent of a wash-away stabilizer. This stuff tears away perfectly. Some people use plastic bags from the dry cleaner (it stretches and pulls too much for me) and I have recently read about using Press&Seal. So, why use this? 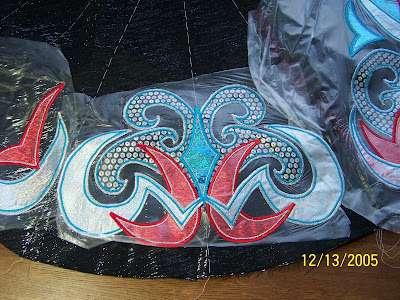 This is see-through and it keeps sequins in place while satin-stitching…no tiny pieces flying into eyes, machines, coffee… But it also helps with coverage around the edge of the sequin applique piece by covering the sharp edges of the sequins which helps keep them from poking through the stitching. However, I will go over edges twice if I need to so it is fully covered. I also digitize my designs and stitch them out on my computerized machine. I do two things that work well to get full coverage. 1) Depending on the thread I am using around the applique, I can adjust the stitch density of the stitching for better coverage, and 2) because my machine does not need to “see” to do its job, I can use a thicker tear-away (in black or white) which really keeps the sequins from poking through the thread. All of this has been about dealing with sequins from the outside. What about the inside? Fuse it!!! Except for the fishscale sequins I have bought from NY Elegant, every length of sequin fabric begins to lose huge amounts of sequins the second it is cut if it not fused properly. So, I fuse the backside well to anchor the threads holding the sequins. There seems to be no real fool-proof way to keep sequins anchored forever (short of spraying them with a thick layer of shellac), but fusing sequin fabric that knots at the back (more expensive) is fairly reliable. I have resolved to be honest with clients about the suitability of various sequin fabrics. Some work…some will shed as you pass the judge’s table no matter what you do. There is also the issue of sequins in the seams. There is the obvious discomfort for the dancer when they scratch; this is not an issue when the bodice is lined with a true bag lining, but I am not going to do this. Sequins caught in a seam are pierced by the needle and are prone to falling off leaving bare spots, and they do not lay flat. We tried one solution: not putting it in a seam that would bend any sequins. 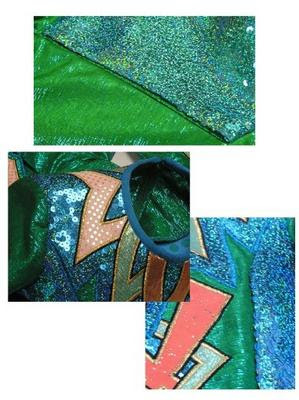 The first pic shows the sequin fabric folded and then sewn close to the bodice side seam. This allowed me to try and fold a line so no sequins would bend or poke and catch the fabric under the arm. Also, there is a generous fold to guard against losing sequins from the cut edge. The second pic shows a few things. 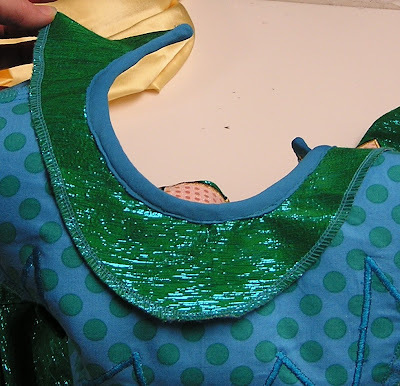 1) The collar was made as a single piece that I attached to the bodice after the shoulder seams were sewn in the base fabric, so, no sequins in the shoulder seams. 2) The neckline is bound with the fabric from the selvage edge of the sequin fabric (only because it was already the right color!). 3) After I sewed the shaped edges of the collar to anchor it to the bodice, I satin-stitched. The third pic shows the folding and sewing of the side bodice piece to the finished bodice. I actually cannot remember if I did the same thing at the waist, but I am assuming I did since the waist seam would fold up and cause bending of the sequins. Have not yet had a request with sequins in the same places, but it will be interesting to see if I still feel this is the best way to handle it.